“We are grass farmers” is a quote from the famous Joel Salatin and I can’t seem to forget it. He explains that in order to grow great cattle, poultry, or pigs, you must have great food to give to them. (Sound familiar?) In order to grow that grass to feed those animals, you must have great soil. Salatin has spoken many times about the work he and his family had to do in order to transform their now successful farm from a rock garden many years ago by first getting the soil healthy so they could grow. Why do we care about grass in our Growing Dome? We don’t, but we do care about growing great food and that translates into having good soil. In a contained environment such as a Growing Dome, nature can’t wreak her havoc on the soil and dry it out or make it flood, but that means the control is up to you. And, it’s incredibly important. However, fear not! We at Growing Spaces are here to help you through the process. 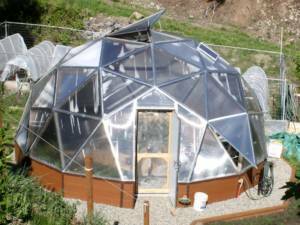 If you have a new Growing Dome, you can start with great soil because you will be purchasing soil anyway. Splurge on this, it will be worth it for the future of your growing life. There are probably just as many opinions as there are soil options about which one product is the best, or a variety of products. Just pick something that speaks to you, whether in the product or the company philosophy. This blog post talks about soil in a new greenhouse, specifically for raised beds. This one really goes the extra mile with step by step intense discussion about starting raised beds in a greenhouse. You can also DIY your own soil mixes such as this article shows http://www.diynetwork.com/how-to/outdoors/structures/soil-mix-for-greenhouses. Ok, you have been successfully growing things in your Growing Dome for a year. What do you do now? Since you have removed Mother Nature’s help in rejuvenating your soil, you will need to do it yourself. While there are Master Classes on soil and the proper ways to do things, here are some basics for you to know. Soil is made up of 50% air and water, and 50% Inorganic materials, minerals, and organic microorganisms. These are the ingredients in your soil that help the roots have structure and grow. Some examples are sand, clay, and rock as well as pore space to allow air into the soil. (Living organisms also contribute to this, and we’ll get to that later.) How these all fit together will depend on the size of these elements in relation to one another. Why is this important? Because it tells you how the soil will act in your garden. Will it hold too much water and not drain well? Will it be too compact and the water runs off the top? Will it not allow for air and space for the roots? Calcium, Iron, Magnesium, and a host of other nutrients that your plants can’t do without. Again, there are many classes on soil nutrients and how to manage them, but basically they need to have them and they need to be bio-available to the plant. Here comes the tricky part – different plants need different amounts of these minerals to thrive. So how do you know what’s what? A little background or online research about the plant you are growing will tell you what it needs (for example, tomatoes should be in soil low in nitrogen, high in phosphorus, and med in potassium). You can get a look at what’s in your soil by having it professionally tested, and if you are having problems in your garden this is what we suggest. Another important factor in your soil is acidity – if the soil is too acidic or not acidic enough this will hinder growth. There is a simple DIY test for acidity here, and if you are having problems with certain plants not growing or not thriving, this could be the problem. 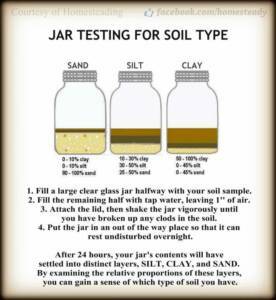 One way to determine what is in your soil is to put some of your soil in a glass jar. Now add water, shake, wait, and watch what it does. Does the water immediately drain to the bottom? Then you probably don’t have enough aggregate in your soil to slowly drain the water. Your roots won’t have enough stabilization to maintain themselves. If the water sits on the top, it has too much clay and needs more pore space and “air” to breathe. Soil is alive. Well, most of it anyway. There are all kinds of little creatures that live in your soil to help it thrive. They live in symbiosis with the plants, in that they give a little and take a little from each other. Earthworms, nematodes, bacteria, and fungi are just examples of what’s there. Decomposing plant matter, roots, and residues of already decomposed items are in your soil too. Got Earthworms? Lucky you. For being as simple as they are, they sure do enhance our gardening experience and help our plants to LOVE being alive! They improve the soil structure by making little pockets for air and water to hang out, and deposit their “droppings” in the soil which plants love. We like to encourage these little guys to stay in our soil by keeping it moist and not using pesticides (definitely not good for the organisms living in the soil). Besides starting completely over with your soil, there are hopeful options. You can have companion plants next to each other that will give what the other plant needs, such as in the case of the Three Sisters. In a similar symbiotic relationship as the organic matter in the soil, these plants will give and take from each other as needed in a beneficial way. Don’t leave soil unattended! 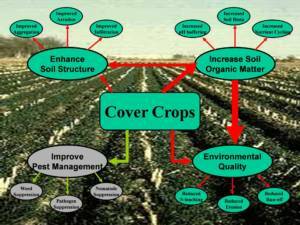 If you have nothing to plant, utilize a beneficial plant such as a cover crop that will keep feeding the soil and the organic matter that is in there. This is sometimes called “Green Mulch” but it really just means a filler plant until it’s time to plant producing crops again. Speaking of mulch, do it! If using store bought mulch, make sure it is organic. When this mulch breaks down, it is adding to the soil rather than depleting it. You can use leaves, tree bark, coffee grounds, tree branches – organic material that will break down and help the soil. Composting can be as simple as dumping kitchen scraps (raw veggies) into a hole next to the plants. This will break down and also enrich the soil. A compost bin is great, but if you have a small space, this works too. There is plenty of detailed information about soil and the different components, how to maintain it, and what to do when you have a specific problem, but the information here will get you started and give you something to think about. You can always send us an email with questions you have about your soil and we will try and help you out! In closing, we would like to introduce you to an organization doing good in the world. SLOW MONEY’s mission is to connect investors with local famers and growers to capitalize the local food system. We strongly believe in their mission, and want to mention their event coming soon. Oct 16 and 17th they will have speakers supporting local food communities that are building healthy soil. Day 1 will focus on the relationship between the actual soil and the soil of a restorative economy. Day 2 will focus on the Colorado program SOIL (Slow Opportunities for Investing Locally). Get your tickets here. Get ready to get your hands dirty. You’ll be addicted soon!